Phil: "We can't be bros no more, bro." The folks at Cupertino seem to be very insular, so if one its inner circle perpetrates an act of betrayal as horrendous as joining forces with Google, it probably wasn't going to go over very well. So when Tony Fadell, creator of the Nest thermostat and one of the founding fathers of the iPod, sold out to Google for $3.2 billion in cash this week, there was always going to be a reaction. In depth: Why has Google bought Nest? 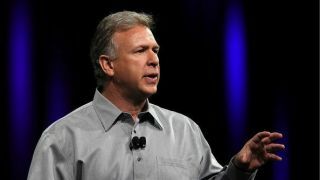 However, there's no way Fadell could have anticipated the catastrophic, soul crushing blow that is being unfollowed by Apple's boisterous marketing guru Phil Schiller. Oh the humanity! New England Patriots fan Schiller, who now only follows 114 people on Twitter has been setting it on fire with insightful recent tweets like "Merry Christmas," and "Happy New Year," has drawn a line in the sand. Rumour has it, a distraught Fadell was last seen wiping those floods of tears away with $100 bills. #PrayForTony.